What could the Check Engine Light mean this time? Good question. Sometimes Check Engine Lights appear as quickly as you turn the ignition, only to disappear as soon as you put the car in D. Other times, you could be commuting on the highway when suddenly, the light turns on for seemingly no reason. If your Check Engine Light is on, your car is trying to tell you something: it could be a minor fix or a major repair in your near future. 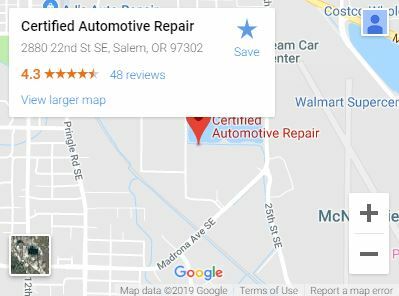 At Certified Automotive Repair, we do everything from diesel servicing, tune-ups, and timing belt inspections, as well as Check Engine Lights for Salem, Oregon drivers on a regular basis. Our highly trained and experienced mechanics troubleshoot Check Engine Lights on a regular basis. When you take your car or diesel truck into Certified Automotive Repair, you’re going to get the best in customer care and auto maintenance, guaranteed. Our ASE-certified mechanics work quickly to troubleshoot the reason for your Check Engine Light, and come up with the necessary repairs in a free estimate. What’s Causing My Check Engine Light? Replace your oxygen sensor: If your oxygen sensor isn’t working correctly, it could reduce your fuel economy. Replace or tighten your gas cap: Sometimes, a missing or loosened gas cap is all you need to turn off your Check Engine Light. Replace your catalytic converter: You need a functioning catalytic converter to pass emissions tests. Come Into Our Automotive Repair Shop Today For a Free Estimate!